I keep forgetting that I’ve been to Shopsins when it was still in the West Village. I had a wonderful stack of banana pancakes and my friend and I ever ran into Drew Barrymore that day. Back then I didn’t really hear any horror stories about people being kicked out or got yelled at. This was probably 6-7 years ago and I totally forgotten about it. Now they’re inside the Essex Market in the lower east side. Pretty much everyone I know has been there and I keep seeing pictures of these crazy dishes. Mac n cheese pancakes?! Though the fear of being yelled at or getting kicked out have kept me away from eating there. But finally I made it…well with help from Blondie of Blondie and Brownie. I felt better going with someone that has been there many times, someone that knows the “rules”. It’s quite impossible to figure out what you want to eat from looking at the menu. Literally there are THOUSANDS of things listed on the menu. 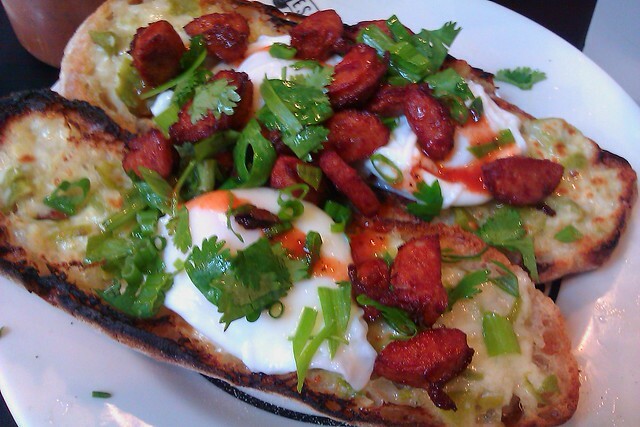 I ended up getting a Santana Pete, 3 poached eggs, melted cheese on spicy garlic bread and topped with chorizo and parsley. It was good and the eggs were perfectly poached but it was not spicy at all. I had to add hot sauce. But I’m still wondering if it was worth $15. I guess I could’ve spent that $15 else where and regret it. I did not regret getting the Santana Pete. Everyone should try Shopsins at least once for the crazy dishes and hopefully get to see someone get yelled at.